Please be warned that we found an issue where some companies/attendees that are existing in your Inova application may not be found in the type ahead, leading to the creation of duplicates (this will be corrected in the near future). Please contact your Inova Customer Success Manager to know how best to handle the import. Since September 2018, EBD Group is using its new version of partneringONE to manage meetings at their conferences. We have updated the EBD Meeting Import capability accordingly, improving its look and feel while also ensuring that it continues to work with this new partneringONE. This article will explain how it works now and give you some tips and tricks to save time during and after the conference. You can now quickly and easily import all your EBD meetings into your Inova Application in a few steps. The first step is to retrieve the data via an export from partneringONE. Then, go to your Inova application and create a new conference. Once the conference created, go to the "Meetings" tab and click on the "Import meetings" button. If the "Import meetings" button is not visible, press Ctrl + F5 to force a cache refresh. If the button is still not visible after this, please contact your Customer Success Manager. Then you just have to upload (or drag and drop) the Excel file previously exported from partneringONE. The Excel file will be analyzed in seconds and you will then be asked to choose which meetings you want to import. The Excel file exported from partneringONE. Total number of meetings ready to be imported into your Inova application. Even if your Excel file includes all the meetings (i.e. including those that are "Requested", "Declined" or "Canceled"), only "Scheduled" and "Rescheduled" meetings will be proposed for the import into Inova. People from your company who attend meetings but who are not yet a contact in your Inova application. If you click on "Map contacts", the attendees will be automatically created as internal contacts in you Inova application. However, the email address will not be filled in because it does not exist in the EBD export file. Choose to import some or all of the meetings from your company. If you are going to attend one of the EBD group conferences soon, here are some tips and tricks to save time. Export all your meetings from partneringONE the day before the conference. Filter the Excel file to keep only the scheduled meetings you will attend. During your meetings, take notes in the "Message stream" column of the Excel file. If you want to import the messages exchanged in partneringONE, write your notes before the messages (press Alt + Enter to start a new line in the cell). If you do not need to import messages, you can simply replace them with your notes. After the conference, import all your EBD meetings and notes into your Inova Application via the Excel file. Your notes will be added in the "Description" field of your meeting in your Inova application. If you upload the Excel file again, the meetings will be updated in your Inova application with the new data from the Excel file. If in your Excel file you have modified the list of participating companies, know that a new meeting will be created in your Inova application. Once you have imported your meetings, you can prioritize them by defining the outcome of the discussion. By doing so, you can easily plan your follow-up efforts according to the level of interest of the potential partner. Using the “Edit Page” button, you can also easily transform your meeting list into an editable format. You will be able to type up your notes and define all the follow-up actions on one page! The Deals and Alliances application can be used on most mobile devices. When accessing the application from a mobile device, users can view their home page and search for frequently-searched objects such as companies or contacts, or check the status or details of an ongoing opportunity. This is especially useful in on-the-go situations such as dashing between meetings at a conference or while traveling. As with any online application, you can bookmark Inova on your phone for easy reference. On your phone, open a browser and enter the application URL in the address field. Tap the "Share" button in the bottom center. Modify the title, if necessary, and then select "Add". You should now see the icon on the home screen of your device. Tap the "More Options" button in the top-right corner. From the menu, select "Add to home screen". You should now see the icon on the home screen of your device. The home page has the same layout of tabs in mobile view as in desktop. The buttons at the bottom of the screen, as indicated in the screenshot, allow quick access to the contacts and companies lists, search, and back to the home page. Tap the contacts or companies button to access the respective list. To search within the list, enter a string in the filter at the top of the name column, then tap "Go" on your device's keyboard. The orange buttons at the top right let you clear the filter or change sorting. Tap the name of a contact to view its overview screen. To view opportunities linked to the contact, scroll down the page to the related tab. Tap the Search icon at the bottom right of the screen. In the Search field, enter a full string, or a partial string with a * for wildcard searches, then tap the Search icon. For more details on how to search the application on a desktop, click here. On the overview screen of most objects, there are some standard action buttons to let you perform updates and track changes. Additional actions are available when the Thomson connector has been enabled. To edit an object, click the "Edit" button. To validate and save the change, click "Save". Assign an object to another system user or owner as needed. To assign an object, click the "Assign To" button in the toolbar of the object's Overview screen. The application will display a Choose Page where you can select the new owner and enter comments for the notification email that will be sent to the new owner. When you assign an object to a new owner, the system will automatically notify that user via email. When an object that you own is assigned to another user, the system will automatically notify you via email. When you assign any object to another user, you no longer own that item, so it will no longer appear on your home page. If the object is restricted and you have not been added to the Authorization list for that object, once you assign it to another owner you will no longer have access to it. So don't forget to add yourself to the Authorization list of a restricted object before reassigning it! This feature is only applicable for companies who purchase Inova custom reports. The Audit Log lists of all additions, modifications, and deletions made to that record or object. The Audit Log also stores the name of the user who made the modification and whether or not the change was made by the user or the user's deputy. Each change is listed with the date, the old and new values of the fields, and the name of the user who made the change. 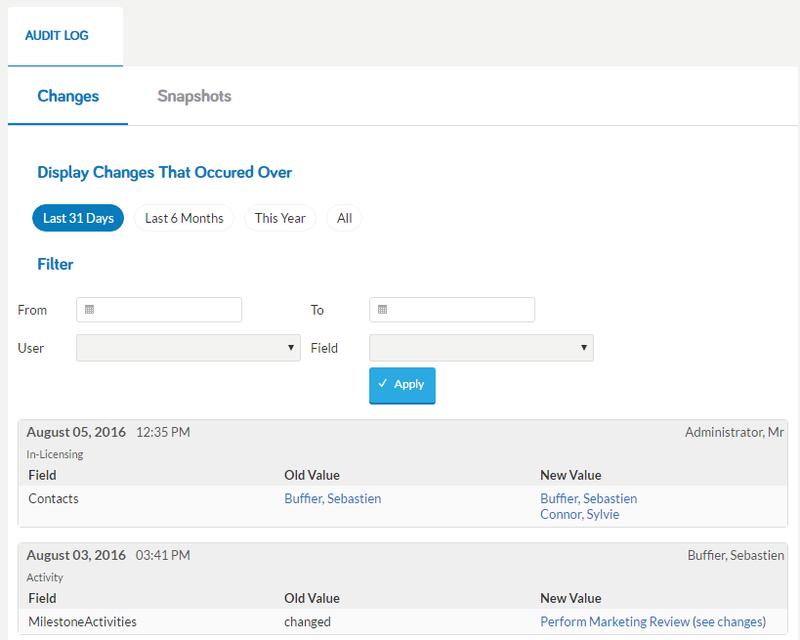 You can filter the audit log by time scale, the user who made the change, and the object type. It also helps identify whether a change was made by a user or her deputy. Within the audit log is an additional feature called Snapshots. 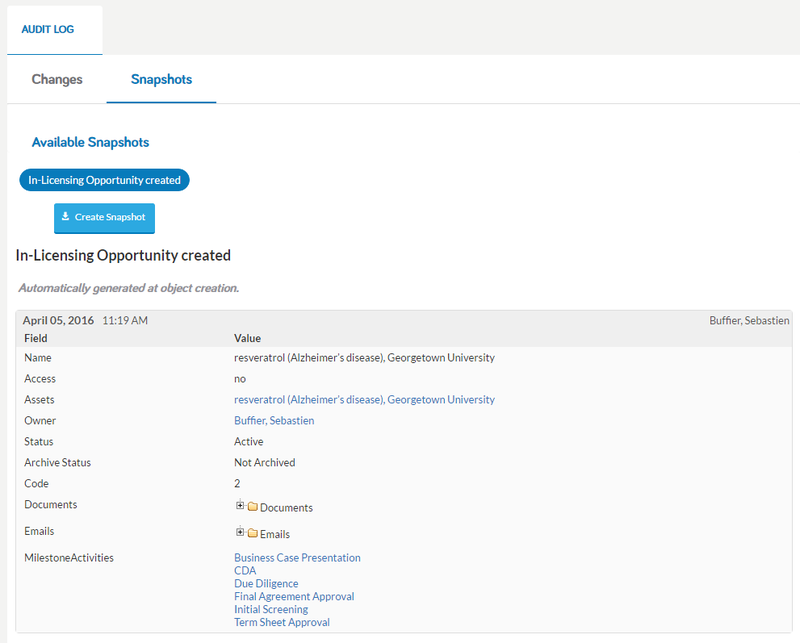 A snapshot captures all the overview details of an object plus its linked documents, emails, and activities. Snapshots are created automatically for an object when it is created, archived, or deleted, but a user can manually create an snapshot at any time. To receive alerts about changes to your projects and other objects, use "Watch It". Every 24 hours, the system checks all the objects that you are watching. If any of them have been updated in the last 24 hours, the system will send you a notification by email that contains links to the overview screen and audit log of each modified object. Updates to any of the fields in the Overview section, such as Product Name, Owner or Status. Creation of a new link between another main business object and the watched object, e.g. when another user links an asset to an in-licensing project you are watching. Creation of a new link between the watched object and an object it contains, e.g. when another user attaches an email to an alliance that you are watching. Deletion of a link between the object you are watching and any other object it's linked to, e.g. when another user deletes a contact from the Contacts portlet of a patent you are watching. When you are watching an object, instead of "Watch It", the button label will say "Stop Watching". To stop watching an object, click "Stop Watching". You can stop watching multiple object in one go from your "Watched Objects" list, available via the main menu. The "Watch It" feature is available to read-only and read-write users only for business objects in the modules they have access to. Your ability to watch certain objects can change based upon whether the owner of an object decides to restrict access to it. If the owner restricts the object but doesn't add you to the authorization list, you cannot see the object at all, let alone receive notifications about it. Contact your application administrator for details. You will not receive a notification when you make changes to an object you are watching. There is no way to see if an object is watched by another user. On some objects, "Quick Create" lets you quickly create a linked object while retaining important links to the object you are creating it from. For example, if you create an agreement from an in-licensing opportunity, the company and contacts linked to the opportunity will automatically be linked to the agreement. See the section "Quick Create" of this article for more details. An alternative to deleting an item is to archive it. Archiving a business object does not remove it from the system, but instead gives it an Archived status which you can use for filtering when configuring lists. Archived items cannot be edited. To un-archive an object and edit it, click "Un-Archive". The page will refresh and the status will change to Reopen. When you click "Delete", the system displays a confirmation message. You can't delete something that is linked to another object. For example, this in-licensing opportunity is linked to a meeting, asset and agreement. These links are displayed in the popup to allow the user to quickly access and unlink them. If you attempt to delete an object and the message "The deletion was impossible because current user does not have right to delete the following dataobjects" appears, it most likely means that the object can only be deleted by its owner. If you need to delete an item and the owner is no longer a system user, contact your system administrator. Deleting a object from the system cannot be undone. This is why in most cases, users do not delete objects, but archive them instead. This allows them to retain the full history of their interactions with other companies and refer back to that history at any time. Every asset imported from Thomson Cortelis can be watched so that when Thomson updates an asset, it triggers the email sent to the watchers. This feature allows you to be automatically reminded when an asset's highest development phase is updated, for example, or a new indication is found. This can help you decide whether it's time to re-evaluate an opportunity that you put on hold or previously declined. When Thomson is enabled, a couple of action buttons will appear on the asset overview screen. The first, "Connect to Thomson", appears when you create an asset manually from the New Asset form. In most cases, the user will search and import the asset from Thomson using the lookup field. But if the lookup isn't available, he can always create the link later by clicking the "Connect to Thomson" button. For assets that were imported from Thomson, the button is displayed as "Update from Thomson". This lets a user manually query Thomson and retrieve any new data on the matching record in Cortellis. Updates are highlighted with a red date in the updated field. See the pages on Thomson Cortellis querying and asset creation with Thomson for details on Thomson-related features. Activities help you track all the tasks that need to be executed and completed on a project or other object. You can assign an activity to another user and set a reminder for them to complete the task. Activities that a user creates or is linked to appear in the "My Activities" tab on their home page. The Activities tab of an object, as described below. The Workflow tab of an object, as described in this page. By default, as defined in the administration module. Note that it's recommended that you use the Workflow tab to manage your milestone and activity tracking. The Activities tab is available on most objects, but the Workflow tab provides better usability and other improvements that will make using the application easier and more efficient. You can create an activity by going on a project or other object and clicking New Activity in the Activities tab. The name allows the owner of the task to easily understand (and later remember) what the task is about. If you want to indicate that the task owner will need some help from other people, use Person(s) Associated. If you add other application users to the task as Person(s) Associated, the task will appear on their "My Activities" tab on the home page. You can only assign an application user to a task. This person is responsible for either completing the task or making sure that the person supposed to complete it does so on time. This person should update the status of the activity when applicable. Until the task status is changed to Completed, the task will be displayed under both the creator's and the owner's home page on the "My Activities" tab. As soon as you save the task, the system will send an email alert to the task assignee. If you have many tasks to complete, Priority can help you track the most urgent ones. The Status is automatically consistent with the Initiated Date and Complete Date. The Status could be either "Not Started" when there is no Initiated Date, "In Progress" when there is an Initiated Date, but not a Complete Date, and "Complete" when there is a Completed Date. Select the appropriate Parent Milestone (see next section). Use the Category to indicate which kind of task this is for reporting purposes. Describe everything that needs to be done in this task. Once the task is complete, there may be some further Action Items to execute. The Initiated Date is the date that the activity is started. The Due Date allows users to sort activities by due date directly on their homepage, in the My Activities tab. The Complete Date indicates that the task is competed. When completed, a task will disappear from the "My Activities" portlet. Additionally, you can set up some reminders. Under Reminder Recipients (automatically pre-populated with your name), you can select the users who should receive a reminder. This reminder will be sent upon the completion of the task if the checkbox "On Completion" is checked, but most users use the date picker to select a specific date as a reminder that the task is NOT yet completed. You can also attach documents related to the execution and completion of the task. Activities can also be used to trigger the scheduling of milestone payment or event due dates related to a contractual obligation. In this case, you must create the activity on the obligation's related agreement before selecting it as a triggering activity. Click here for details about obligations and here to learn about triggering activities. To edit an activity to change the due date or the content of some fields, click "Edit Activity". Note that if you try to remove a date while editing the activity, you will have to also update the status field for the change to be correctly saved. You can archive an activity to filter it out from the lister view. If you want to change the assigned person, click Assign To. An email about the change of ownership will be sent to both the previous and the new assignee. You can delete an activity that is no longer valid for the project. To learn more about tracking activities within the new workflow tab, check this section on Milestones. Below we can see an example of an active project's workflow, with the Screening phase completed and the Due Diligence phase ongoing. The "Triage Meeting" activity, belonging to the Screening milestone, has been completed. The "Prepare CDA" activity, belonging to the Due Diligence milestone, is in progress. The user can click Complete and select the completed date for the milestone in the popup, indicated that the task has been completed and entering any related comments. The "Scientific Evaluation" activity, belonging to the Due Diligence milestone, has not yet started. For this milestone, the user can click Initiate once the task has started and is in progress. Doing so will automatically populate the Initiated Date with today's date. The "Marketing Evaluation" activity, belonging to the Due Diligence milestone has not yet started. The user can click on Complete and select a date in the popup to indicate that this task has been completed. Doing so will automatically populate both the Initiated Date and the Complete Date with the date selected in the popup. Default child activities can be edited and reordered, but not deleted. The Deals and Alliance application includes advanced reporting features that allow users to generate dashboards in various formats, including funnel charts, bar charts, pie charts, tables, and heat maps. These reports can be exported to Excel or PowerPoint. In addition, a scheduling feature allows the users to receive reports on a regular basis via email. Dashboards are not populated with system data in real time, but by a connector that brings in the data on a daily basis. So when users add or update data in the system, they will only see the related modifications to the dashboards the following day. With advanced reporting, a library of pre-configured reports are available in the application. These reports generally follow the standard configuration of the application. Click here for details. In the main menu, click the Dashboards link. If the link is not displayed in the menu, the dashboards have not been activated. Contact your Inova administrator for details. To see a list of all the dashboards available to you, click All Dashboards. The dashboards are grouped by module. All dashboards can be filtered. To see filter options, click the Show Filters button. Filtering criteria are displayed in grey, as shown in the screenshot. Check the values you want to filter by. You can filter by multiple criteria at a time. Click Apply. The criteria will automatically be applied. To remove the filter, click Reset. If the standard dashboards do not meet your reporting needs, it is possible to create your own. To create dashboards, navigate to All Dashboards>Custom Dashboards. Select a tab where the dashboard will be placed. Tabs let you group and organize dashboards as you create them. Select the type of object you want to report on. Set the chart configurations. As you make your selections, the tool will automatically display a preview of the what the chart will look like. Click Save Dashboard. The chart will be displayed in the tab you selected. The Agreements section allows the user to create and maintain all post-deal signature activities. This section is generally used by the Alliance Manager as a central repository of all activities related to the agreement in collaboration with the finance and legal teams. Enter the name of the agreement. Link the company related to the agreement. If you use the Quick Create option from an In-Licensing Opportunities, the company field will be prepopulated with the company linked to the opportunity. Click the "Details" section and fill in the fields as needed. Click the "Priority" section to display additional fields. These fields can be used prioritize agreements and allocate related resources. Fill in these fields as needed. Manage your contacts including the ones not in a governance body. Reviews for asking colleagues for their opinions, to review information, and perform alliance health checks. In some cases, when a relationship with another company involves multiple agreements, it can be useful to linked the various agreements together under a single Alliance. The Alliance object acts like a portfolio for all the agreements, gathering on one screen all the rollups of all the related obligations, activities, and payments associated with the different agreements. To create an alliance, click the "New Alliance" button on the "Alliances" tab, populate the required fields, and click "Save". As with agreements, alliances include key features such as their own governance bodies, issue logs, documents, contacts, reviews, and notifications. Note that the alliance is generally used by companies with very advanced organization around alliance management. For smaller or simple organizations, it's possible to indicate a multiple-agreement alliance in the system by linking agreements to one another. Also, it is possible to push an email to an agreement, but not an alliance. Contact and company are two of the most important object types in the Inova application. Each provides an overview of past and ongoing interactions between your company and another organization or individual person, serving as a hub of related information and linking multiple opportunities and business relationships. Companies let you store and maintain basic information for companies, universities, VCs, labs, and other types of institutions and organizations. A company can be linked to almost all other business objects in the system, and is often a required field on projects, assets, and agreements. The overview tab, which contains basic details such as the address and company URL. The "Parent Company" links the company to its parent to show a two-level structure of a company and its subsidaries. Only one parent can be selected per company. Tabs that contain links to all the key interactions you have with the company, such as agreements or licensing deals. The tabs you can see on a company overview screen are defined by your license. Likewise, the deals, agreements, and other objects displayed in those lists will only be those you have been authorized to view. If you do not see a tab, project, or agreement that you believe you should have access to, contact your Inova administrator. Additional tabs will contain links to your key contacts at the company, as well as any documents and emails uploaded to the company record. If document roll-ups are configured in your system, documents uploaded to the company will also be rolled up to any object the company is linked to. Emails, however, do not roll-up to other objects. In the case where there is an ongoing transaction with another company and the interactions are being tracked on another object such as a project, then it is recommended to push emails, detach attachments, and upload documents to the project, not the company. On the Companies list, click "New Company". The system will display the new contact form. The modal window (sometimes called "quick create") lets you create a new company on the fly while creating another object. Click Save in the modal window. 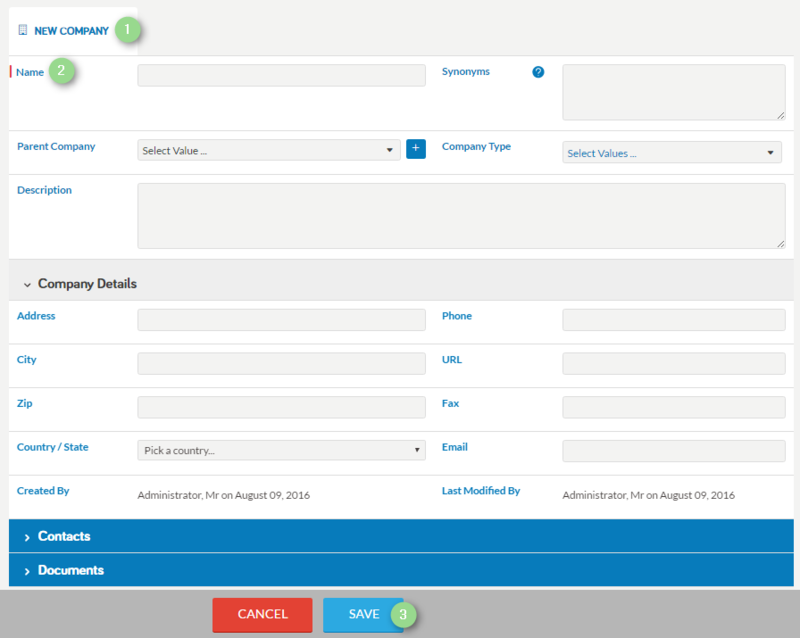 The screen will refresh and display your new company's name in the field. To save the new company record, you must save the linked object as well. The Outlook Add-in allows you to create a new company record while pushing an email from that company into the Inova system. For details about this feature, see this article. The same features that let you import asset records from Thomson will import and create company records in Inova. For details, see this article. Contact groups are used for communicating with groups of contacts and/or users via an alert or in a review, or for granting authorization to restricted objects or documents. Contact groups can be private or shared. Access a contact group by clicking its name in the Contact Groups tab on your home page or in the Contact Groups tab in the Contacts list. The members of the group will be displayed in the Contact Group Members tab. To create a new contact group, click the New Contact Group button in the Contact Groups portlet. The New Contact Group form will appear. If you have "Enable to Share Contact Groups" rights, you can choose "Shared" to share the group with the other users. Otherwise, all your contact groups will be Private. Select the Group Type from the dropdown menu> This selection will pre-filter by type the list of contacts you can include in the group. This selection is important, as not all types of contacts can be included in all use cases. Click "Save". The system will display the Contact Groups Overview screen. Now click Choose Group Members. The system will display a contact selection page, as shown above. The list of contacts you can add to this list is filtered as per the type of group selected in step 3 above. Select the members of the group and click OK. The system will save your selections and display the Contact Group Overview screen. You can only edit the groups you own. Most users can only create private contact groups. Your application administrator can create shared groups, which are shared with all users but managed by the administrator. In such cases, only the administrator knows who the group members are. When using contact groups to grant authorization to restricted objects, you can only select a group comprised of users. In this use case, the contact group can contain any type of user. Contacts let you store and maintain contact information for clients, subject matter experts, potential business partners, and others. You can associate contacts with almost all other types of business objects in the system, including projects, agreements, and companies. When you open an object such as a project or agreement, the linked contacts are listed in the Contacts tab. Contacts can also be added to Contact Groups which can be included in reviews and authorization decisions. The Overview tab, containing basic details about the contact including the category, type, and role. Tabs that list all the key interactions your company has with a contact--for example, any in-licensing deals where that contact has some association with the transaction--as well as any supporting activities or communications. Depending upon the modules you are using and/or have access to, you may see more or fewer tabs than what is displayed in the screenshot. If you are not seeing a tab you believe you should have access to, check Page Settings or talk to your Inova application administrator. Application User - the person can log into the application itself. When a new user is added to the application by the Administator, a contact record with this type is automatically created. Internal - the person is not a user, but is a contact internal to your company. He is able to participate in reviews and receive alerts and reminders from the application. External - the person is not a user and is not within your company, though he may be affiliated with a partner company or a member of your network of experts. He is able to participate in reviews and receive alerts and reminders from the application. Populate the required fields. Don't forget to set the correct Type! The modal window (sometimes called "quick create") lets you create a new contact on the fly while creating another object. After entering the rest of the data in the linked object, click Save. To save your new contact record, you must save the linked object as well. Note that on some forms such as the Choose Participants page of a review, clicking the plus button will not display the modal window, but will instead display a New Contact form. Follow the same steps to create and save the new contact. The Outlook Add-in includes a feature to create new contacts in Inova while an email is being pushed in to the application. For details about this feature, see Contact Push. With D&A, you can query Clarivate Analytics' Cortellis database and import one or more assets with the associated company information, facilitating data entry. The option to search Cortellis and import a single asset based on a match to its name or a synonym is explained here. The information below focuses on advanced querying, which lets you search for drugs across multiple criteria and then import multiple products at a time. A new asset will be created. Its fields will be populated with whatever data is contained in Cortellis. The exact fields are listed in the steps below. If they already exist in your Inova system, the associated Company and Licensee / Partner will be automatically linked to the asset. If those companies don't yet exist in your Inova system, the tool will import them and link them to the asset. To learn more about querying Thomson for company information, see this article. Cortellis content is created and maintained by the companies entering it in that database. Inova does not create or manage this data. There is a chance that a company entering information in Cortellis will enter their company name in a slightly different way than how you have entered it in your Inova platform. If this happens, a duplicate company record would be created. Click here to learn about removing duplicate companies from your Inova system. Otherwise, if you notice any errors or discrepancies in the imported data, contact your Clarivate Analytics rep.
Activating this feature requires a special license from Clarivate that is separate from your Inova license. You will need to contact Clarivate directly to obtain this special license, configure the query options in administration, then update your user profile as well as the main menu. - Link to highest status: limit the query to criteria associated with a specific highest development status, as opposed to 'any status'. Tree list fields in the query form allow you to browse through and select options from the Cortellis biopharmaceutical ontology. To display optional values in a tree list, click the field. The system will display the first level values. Click the plus sign next to a category to expand a list of subcategories. Click the category to add it to your search criteria. Note that if you select a category with a plus next to it, the feature will search on all the subcategories as well. In the example screenshot above, if the user selects "bleeding," the query will include "brain hemorrhage," "contusion," and "epistaxis," and all the other categories under the category of "bleeding." A tree list also includes the typeahead feature, allowing you to search for a category by typing in the first few characters into the field and then selecting from the results. Data in the imported assets will follow Cortellis ontologies. As described above, tree lists allow you to search by browsing and selecting from these ontologies, rather than typing them in manually and perhaps misspelling or misnaming a category ("cardiology" vs "cardiovascular disorder," for example). Tree lists improve search results and help keep list value data clean. Records that have never been imported (1) and don't yet exist in your Inova platform are differentiated from ones that have been imported by the refresh icon (2). Check the box next to each asset you want to import. If you select an asset that was imported previously into your Inova system, the feature will update that asset with the current data in Cortellis. From this popup, you can click Select to import the details or Close to return to the query results. Click Import. The system will import the data and display a confirmation screen once the import is complete. Once imported, you can find your imported assets by searching the assets list and sorting by Created Date descending. The Cortellis Advanced Query feature is helpful for users who want to proactively scout strategic assets and build a corporate memory of this information. Some companies have a dedicated competitive intelligence department, while others have scouts who work with the business development team on this effort. I want to research the marketplace for drugs within a certain criteria so my company can take action on as many in-licensing opportunities as possible. Define your serach criteria (TA:X and Development Phase:Y). Import all assets returned in the search results. In your assets list, filter the list to display the imported records (Source of Referral = Cortellis, Created Date = today's date). Quickly evaluate each asset. Use the Review feature to ask your colleagues for their expertise. Update the status on each asset to Pursue for those that are of interest, or Decline or On Hold for those that are not. Create an in-licensing opportunity for each Pursued asset and assign it to your BD colleague. Watch each On Hold asset to receive alerts when details in Cortellis are updated by the related company, e.g. when the development phase is modified. I want to research the marketplace for drugs competing against my company's drug; I want my drug to be more competitive. Define your serach criteria (in this scenario, the criteria could include a specific company you are competing against in the marketplace). Update the status on each asset to Monitor. Watch each asset to receive alerts when details in Cortellis are updated by the related company, e.g. when the development phase is modified. If you want to apply these use cases but your menu configuration is not set up to display the assets list, talk to your Inova application administrator to have the menu changed. The Inova platform has a connector to the Clarivate Analytics Cortellis database. When this connector is enabled, you can search for and import assets (products and compounds) and their related companies from Cortellis into the Inova system. This can be done via the advanced query form or directly from the new asset form itself. The query form is useful for searching Cortellis for multiple assets across multiple criteria, especially in a competitive intelligence use case. For details on using this feature, click here. The Cortellis query feature on an asset is useful when you want to search for an asset specifically by name or synonym and if you want to avoid creating duplicate records in your Inova platform. The Cortellis query from an individual asset is described below. Put the opportunity you are working on in Edit mode, then click the plus button next to the assets field. As you enter the name, the query feature will automatically begin suggesting matches. Matches with a connector icon come from your Inova platform. If you select one of these records, the system will refresh the screen and display the current data it already has for that asset. Note that this means the system is also informing you whether you are already tracking that asset and thus helping you to prevent from creating duplicate data. Matches with the Clarivate icon come from Cortellis and have not yet been imported into your Inova platform. If you select one of these records, the system will import the current data for that record from the Cortellis database. The proposed matches are listed in order of last modified date. When you select the asset to import, the system will refresh the screen and populate the fields of the asset form with the data in Cortellis. If the company linked to the asset in Cortellis did not previously exist in your Inova system, the connector will import the company record as well and link it to the asset. If you have already created an asset in the system, you can link it at any time to a record in the Cortellis database. Click on the asset name to display its overview screen. Using the text in the name field, the system will query Cortellis to find a match. It will search for assets containing the same text in the name, synonym, and scientific summary fields. Click the ID of the asset of interest to view the full record to be imported. If this is the asset you want to import, check the box to Select it. If it's not, click Close, then click Modify Query to change the query criteria using the advanced query form. Once you have selected the asset you want to import and link, click Connect. As shown below, the data brought over from Cortellis will populate the Cortellis Data tab, not the Overview tab, so the information imported will not overwrite what you had previously entered. Any fields that are updated will display the update date in red. Your Inova administrator can also configure a scheduled update of all the imported Cortellis data in one go. Contact your administrator for details. Note that updates to Cortellis data linked to Watched assets will trigger notifications. This means you can import an asset, put it on hold for the time being, then receive an alert when it moves to the next development phase or is classified under a new indication that better fits your company's BD strategy. 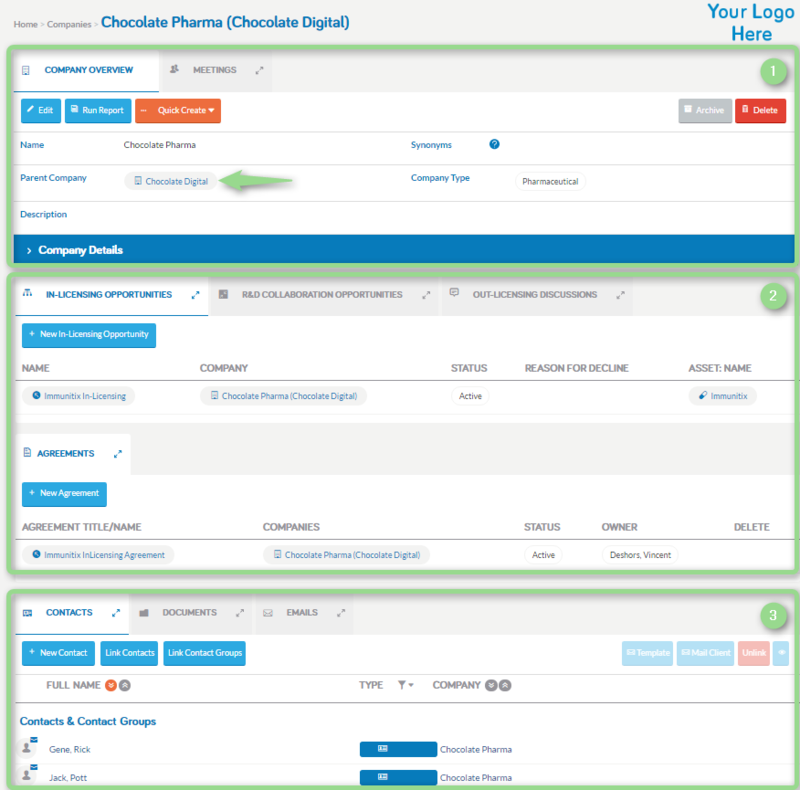 Almost all business objects in the Inova system, including companies, contacts, agreements, projects, and assets, are designed using form configuration, which creates or builds business objects out of a combination of fields set in a specific layout based on a standard configuration (and usually including some client-specific modifications). Once created, most business objects also have the same overall structure: An Overview tab plus various other tabs with supporting objects. Likewise, the process to create a new object from its New form is basically the same across object types--the steps below apply not just to opportunities, but to all types of business objects in the application. In the main menu, click Opportunities, then click New Opportunity. Or, click New Opportunity button under the Opportunities tab on your Home Page. (1) Some fields in the form are mandatory, as indicated by the red bar. You must populate these fields in order to save the opportunity, although in some cases they are pre-populated with data, e.g. the Owner field is always pre-populated with the name of the person creating the object. (2) Some fields contain links to other objects or list values (in the case of the opportunity shown above, you can link it to an asset object). When you begin to type into these types of fields, the typeahead feature will search the system and display a list of matches. Click the value you want to select it. You may be allowed to select multiple values for a single field; in this case, the field will contain the text "Select Values..." in blue. Other fields only allow a single selection. In a single-value listvalue field, "Select Value..." will be displayed in black. (3) If in (2) you don't find the value you're looking for, click the plus sign button to "quick create" the object. Quick create of a company or contact happens via a modal window. Quick create of other objects such as assets happens in a separate screen. The system will open a New form of that object type. You must populate at minimum the required fields on that object, save it, then save the main object. Note: If you cancel creation of the main object, the linked object will NOT be saved. (4) Some fields include data entry rules that cause fields to appear, disappear, become mandatory, etc. based on how data is entered in related fields (see below). (5) Date fields are populated using a date picker. Click the calendar icon to select a date. It's not possible to type a date in manually. This enforces good data quality, as all dates are formatted the same way throughout the application. (6) Additional fields can be organized in collapsible sections. Click the blue bar to expand the section and populate the fields. (7) The save and cancel buttons are always displayed at the bottom of the screen, even as you scroll up and down the form. After entering the data into the fields, click Save. The screen will refresh and display your new opportunity. If you forget to populate a required field, the system will display a warning message in red and highlight the fields you still need to fill in. In most client configurations, the number of required fields on any given form is minimal. In addition to typeahead fields, some forms include a duplicate check configuration in which, according to certain pre-defined rules (e.g. a combination of an existing asset name + existing company name), the system will display an alert that a possible duplicate record is being created. To find out more about the duplicate check feature, see this article. Data entry rules help enforce data entry compliance in the system. These rules are implemented by Inova as per client requirements. In the above example, when the user selects Yes (1) for CDA?, the system displays two new fields, CDA Effective Date (2) and CDA Termination Date. (3) Note that neither of these dates is required. The dates do not appear in the form into (1) is selected or triggered. For users with email providers other than Outlook or users accessing their Outlook via the cloud (e.g. Office365), emails can be forwarded into the application and linked to new or existing objects. Note: The application has to be configured to connect to an email server to use this feature. See this page for additional information, or contact Inova support. 1. Forward your email to the application (most common format of this email address is companyname@fetch.inova-software.com). The My Emails queue (1) is filtered to display emails you forward into the system from the email account associated with your user profile. For example, if you primarily use Outlook via Office365 and that email address is configured in your Inova user profile, those emails will appear by default in My Emails. To see emails from a different account such as gmail, just change your email address in your user profile and those emails will be displayed as expected. New emails in the queue (2) are highlighted in dark grey. The email you select to view is highlighted with blue (3). 5. From this point, use the same features as are available in Advanced Push to choose or create the object to link the emails, link the email, and detach attachments. See this page for more information. The Inova system allows you to create and link emails to various types of business objects. You can link emails to companies, assets, opportunities, discussions, agreements, acquisitions, divestitures, and potential acquirers. An email can also include one or more attachments of almost any file type, including other emails. The Outlook Add-in: Emails can be sent directly from the application or imported ("pushed") into the application from Outlook and linked to new or existing objects. Email Fetch: For users with email providers other than Outlook or users accessing their Outlook via the cloud (e.g. Office365), emails can be forwarded into the application and linked to new or existing objects. The Emails Tab, explained below. Click the Emails tab to display the list of emails attached to the object. By default, only the first 10 emails are displayed. To view the full list of emails in lister mode, click the double-arrow ("expand") button. Click the Subject to view the contents of an email. If you create Views of the emails list, access them by clicking here. Use this option to send an email directly from the application and store it in the object. 1. Click New Email. The application will open a new mail from your email provider, i.e. Outlook. The To field will contain the mail address of the application object. If you do not want to share the application's email address with the other recipients, copy and paste it to the BCC field. The subject line of the email will contain the object code within brackets. This code creates the link between the email and the container object in the system. Do not edit the information within the brackets or the link will be broken. 2. Add additional recipients in the To, CC, or BCC fields. 3. Enter the content of the email and click Send. 4. Check the Emails tab on the object. A copy of the email you just sent will be listed there. To reply to or delete an email, click first on the email title to open it. Click here to reply to an email stored in your object. Your reply will be sent to the recipient and stored in the application. Click here to delete the email. Note that if the email was pushed in from Outlook or forwaded in using email fetch, deleting it from the Inova system will NOT delete it from its original source. You can use the system to send an email to one or more contacts, e.g. to give some new information to some contacts associated with the opportunity you're managing. Select Template or Mail Client. When you select Template, a popup appears as shown below. The contact(s) you selected in step 2 will be pre-populated (1). Fill in the form as-is or select from the available templates available in the dropdown (2). A template can have a pre-populated subject line and body (3) and other preset options (4): To have the email sent individually (recipients cannot see other recipients in the distribution) and to have a copy of the email stored on the container object. Note: Templates are created and stored in the application's administration section. Contact your administrator for more information. Optionally, you can attach documents to the email. These documents must be already in the document manager of the container in order to be attached in this form. If you select Mail Client in step 3 above, your email-application will open a standard new email with the recipients, subject line, and body pre-populated, as shown below. Note that when you select Mail Client, a copy of the email will not be saved in the application. You can also use an email template to email a document right from the document manager. Perform the same steps as above to update the content and send the email. Financial Obligations allow you to track all your incoming or outgoing payments linked to an agreement and to manage the notifications needed to ensure all obligations on a contract are met. Payment tracking in Inova can be useful for reporting and budgeting purposes. With this improved version, you can now manage the Financial Obligations directly from the agreement, without leaving the page, and thus save time. You can create a Financial obligation through an existing Agreement. On the Agreement overview page, scroll down and click on the tab "New Financial Obligation". A New Financial Obligation pop-up will display and in the "Details" tab you will enter all the financial information needed for reporting purposes. Enter the title of the Financial Obligation. Select the type of currency and enter due amount. Activate the "Forecasted" button, according to the type of Financial Obligation. The "Description" field can be very useful to enter detailed instructions on how royalty is calculated (i.e. the formula that should be used for royalty rate calculation). If you select the type "Milestone", it means that the amount to be paid is known but not the date of payment. In this case, activate the forecasted button for the "Due date". If you select the type "Royalty", it means that the date of payment is known but not the exact amount. In this case, activate the forecasted button for the "Due amount". If the agreement has multiple companies, we highly recommend that you create a separate financial obligation entry for each company and/or asset within the agreement. If multiple companies and/or assets are in a single financial obligation entry, it may be difficult to consolidate reports. As you are completing the details on the financial obligation, you will notice another sub-tab called "Reminder". This tab will allow you to notify application users about the due dates. This setting notifies you X number of days in advance of your financial obligation reminder's due date. There is an easy way to duplicate an obligation/payment within an agreement. Go to the "Financial Obligations" tab. The system will automatically create a duplicate of the financial obligation you have selected. Customize the information on the "Details" and "Reminder" tabs and click "Save". Make several copies of this FO without changing anything. You will be then able to modify all of them at the same time! You can configure this lister to add more fields if needed. This can be very useful, for example for royalties to forecast the next 5 fiscal years. Once you have created a financial obligation, you can start making a payment. click on the dollar icon. Enter the due amount. For all forecasted amounts, you have the possibility to change the amount. Add a comment. You can enter the transaction number for example. If your balance is 0, the obligation/payment will be automatically closed after clicking on "Save". If your balance is different from 0, the obligation/payment is considered as not closed. You can close it manually by clicking on "Yes" and then "Save". The system will automatically display the full balance; therefore, you have the option to make a partial payment or pay the full amount due. If a partial payment is made the system will show the remaining balance and if the full amount is paid, the system will automatically close the financial obligation. A Governance Body helps to track the activities, tasks, and documents gathered by a steering committee or other governance body managing an alliance and its related obligations. Governance bodies are most often used in the case of complex alliances or deals where high-risk obligations must be managed and fulfilled. See Alliance Management for details. Click New Governance Body on the tab. Enter a name for the governance body. The company field will automatically be populated with the company associated with the agreement or alliance. Add members to the governance body via the contacts tab. A governance body has its own document manager, emails tab, and activities tab. The committee can track its meetings, meeting minutes, and any urgent action items using these tools. Since the version 7.1.86, a new module, named "Due Diligence", has been implemented to allow internal collaboration as well as secure data exchange during the due diligence process. A new "Guest" profile has been added to allow temporary access to the Due Diligence module. As a Guest on this module, you have a Read Only access, limited to the Overview tab, of the due diligence rooms you are invited to. You also have a full access to the Document Manager. You have no access to the linked business objects. As a Guest on all other modules, you have Read Only access, limited to the Overview tab of non-restricted objects in that module. You have no access to contained objects (e.g. reviews, documents, emails, and activities). Do not use Guest license on all other modules, except in very specific cases identified by your Customer Success Manager. As a Readwrite on this module, you can create and edit due diligences rooms you are authorized to. As a Super User, you have the same rights as the Readwrite users, plus you have access to all of the Due Diligence Rooms via the search. The "Readonly" and "Executive" licenses are not supported for the Due Diligence module. To be able to create and manage due diligence rooms, you must have "Readwrite" or "Super user" access to the "Due Diligence" module. You must also have Readwrite access to the In-Licensing and/or Out-Licensing modules to be able to create Due Diligence rooms. This will enable you to involve your internal experts in the due diligence process and grant them temporary access to the confidential information. Please note that it will also copy the authorization list from the original object (in-licensing / out-licensing project), except the Contact Groups. A due diligence room is restricted by default. This cannot be changed. Only users with Readwrite or Super User rights on the "Due Diligence" module are proposed. If you set another user other than yourself as owner, you will not be able to access the due diligence room after you click save. A notification will be sent to the new owner. Two possible choices : Active or Closed. When you type a URL in this field, it will become a clickable link. Once created, go to the "Members" tab and then click on "Add Contact" to add the participants. Then start typing the name of the member you want to invite to the due diligence room and select this user. The persons you are allowed to select are only application users having Guest or ReadWrite or SuperUser access to the Due Diligence Module. You cannot add a Group. If you start typing the name of your company in this field, you will obtain the list of all contacts with correct access rights (Guest/Readwrite/Super User) for the "Due Diligence" module. Adding members is not done through the authorization list because it does not send invite emails. So please remember to use the "Members" tab instead. As the Due Diligence Room is a private place for temporary use, there is no entry in the left menu. for users who are authorized (Owner, Authorized User) to a Due Diligence Room. Once the documents and comments of the various experts have been gathered and analyzed, the Due Diligence Room Manager will consolidate the results in a document to be uploaded to the Due Diligence Room. When the due diligence room is closed, all members are informed via a notification. As a result, they no longer have access to the DD Room. You can collaborate and share your thoughts and questions with the other members via the "Comments" tab. You can also consult and/or modify the documents added by other members and add new ones. Meetings allow you to keep track of meetings you have organized or participated in, internally or outside the company. Conferences allow you to link these meetings to a single conference or other related event. Meeting can be separated into two use cases, internal and external. Internal meetings can be linked to one or more opportunities to be discussed. Participants can make comments directly in the meeting itself before it happens, exchanging information and guaranteeing a productive session. External meetings are useful for tracking interactions with partners, and for viewing meeting history when preparing for an upcoming conference or event. External meetings can also be populated into the system directly from conferences and other partnering events that use the One-on-One platform. The overview screen displays the meeting details. The conference field indicates whether the meeting is part of a conference. It can be used to group the meetings list by conference and view all the meetings that took place at a single event. Projects and agreements can be linked directly to a meeting. Link contacts to a meeting as Attendees. Store your meeting minutes and other files in the Documents tab. Store preparation and follow-up emails. To link emails to a meeting, use email fetch. The overview tab contains general information about the conference. Click the Meetings tab to view all meetings your company participated in during the event. 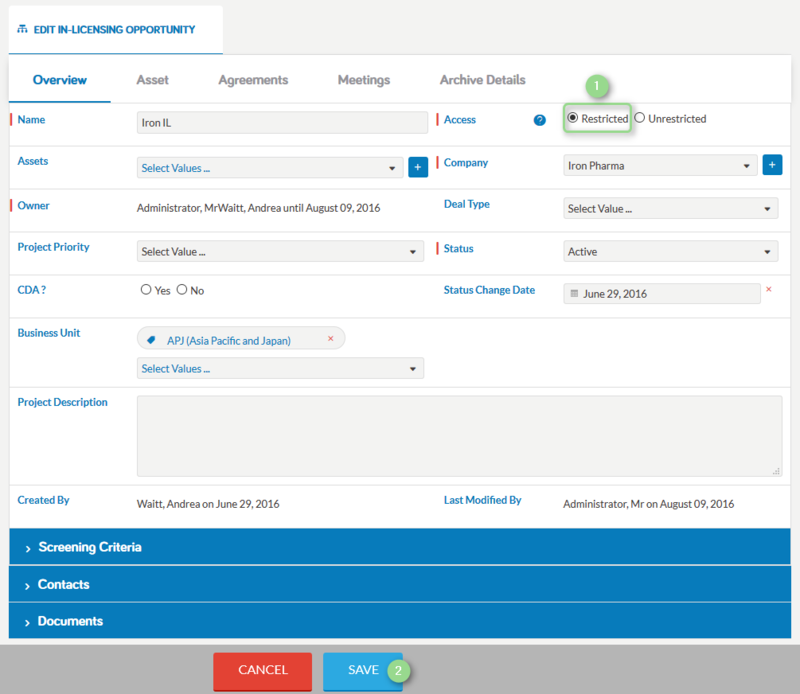 Starting with version 6.1, it is possible to have meeting, conference, company, and meeting attendee information copied over from the One-on-One partnering system into your D&A platform. Meetings created through this integration are external and will be linked to a conference record. With this integration in place, BIO attendees who also use the D&A platform for opportunity tracking can refer back to past meeting information to decide if and when to schedule future meetings with potential partners at upcoming partnering events. The meeting and conference data populated from BIO enriches the data related to opportunities already being tracked in Inova, adding to the history of interactions and partnerships with important contacts and making follow-ups more effective. The data is also automatically searchable in the mobile view, so as you are racing to your next partnering meeting you can quickly grab your phone, look up the profile of the person you're seeing next, and review it to refresh your memory about any key details from past interactions that would help make the next session more productive. Here's how you can use the integration to make your BIO meetings more productive. When a BIO partnering meeting is scheduled in One-on-One, the data about the meeting as well as the linked company and meeting attendees (contacts) can be imported into your Inova platform. Before the event starts, your colleagues who will not attend the BIO event can enter information you need to discuss at a meeting in the meeting's Notes field. During the meeting, you can add your own notes into the same field. Assuming the meeting was successful, after the conference you can create an opportunity (e.g. an in-licensing project) from the meeting to track your ongoing interactions with that company and centralize the emails and documents you exchange over time. Before the next major partnering event, review the opportunity and company details to help you decide whether you need to meet with the company again. Note: The integration also imports similar data points from meetings held at EBD events. For more information about this integration, contact your Inova Customer Success Manager.